During a recent trip to Denver to join in presenting a national award for state arts leadership to Governor Hickenlooper, Deborah Jordy, Executive Director of the Colorado Business Committee for the Arts, approached me. "There is someone I'd really like you to meet." Curtis Bean was his name. A remarkable community activist, an entrepreneur and an artist, Curtis is doing transformational work through the arts. He is also a Veteran. Straight out of high school and over the course of five years and two tours in Iraq, he completed his military service as an Army sniper. Like many others, Curtis returned home with post-traumatic stress disorder (PTSD). He planned on being a fireman, but anger and nightmares were interfering with his life. His girlfriend, an art student, suggested he try painting when counseling wasn't enough, and that's when something clicked. Healing started to happen -- and a new doorway was opened. The artist within that Curtis discovered as a result of working through his own PTSD experiences made him passionate about helping fellow Veterans recover from the ravages of combat that so often follow our young men and women home -- and remain with them, sometimes for a lifetime. My visit to Denver led me to the doorstep of the first Veterans of Foreign Wars (VFW) Post in the United States of America -- and the largest in the state of Colorado. As I entered the VFW Post 1, founded in 1899, I saw Curtis' artwork along the way to a 7,000-square-foot gallery that was purchased in June. The gallery is home to his ambitious Art of War Project -- a project he started that provides a positive outlet through art, and inspires hope and contributes to the health and well-being of American Veterans dealing with PTSD. 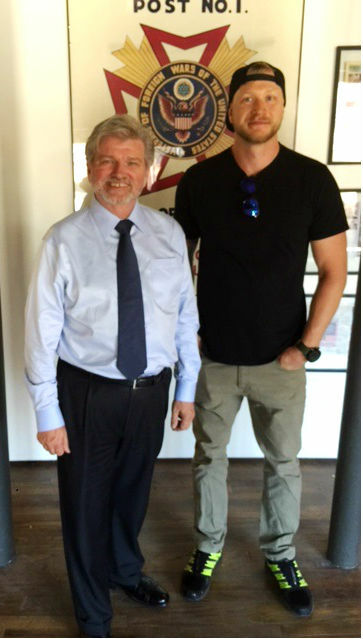 Robert L. Lynch (left) with Curtis Bean at VFW Post 1. Early on, leaders at Post 1 recognized Curtis' talents -- not only in the arts, but in organizing and activating a community. They connected him with the University of Colorado Denver's Boots to Suits, a mentorship program that brings local business professionals together with Veterans. Boots to Suits introduced Curtis to Deborah Jordy, who helped him build the business plan that expanded the Art of War concept, as well as their partnership with the VFW. The boldest move was when Post 1's commander, Navy Veteran Michael Mitchel, invited Curtis and Art of War to become the public face of the new hall for the post -- by running the gallery that they envisioned for the 7,000-square-foot warehouse space they were buying in the heart of Denver's Santa Fe Arts District. An unconventional relationship to be sure, but the risk is paying off. 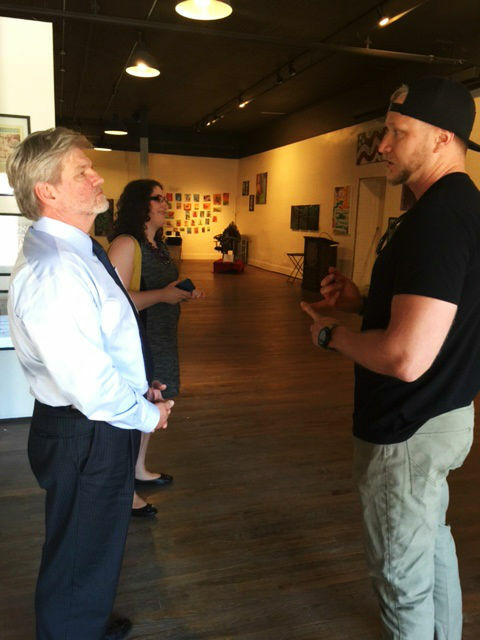 In addition to serving Veterans, Art of War is helping to bridge the military-civilian divide. Everything is free for Veterans and their families. Film nights are held the last Friday of each month and the gallery is open to the public for the First Friday Santa Fe Arts Walk. Free gallery space is offered to Veterans so they can show and talk about their work to civilians. Robert L. Lynch and Curtis Bean at the gallery in Denver's Santa Fe Arts District. Across the country, stories of how Veterans come back -- and what they give back -- after overcoming sometimes decades of struggles with combat and service-related illness and injuries are emerging. These stories were told last month in Durham, North Carolina at the National Veterans Creative Arts Festival. The event featured 120 Veteran artists, and award-winning acts from the music, dance, drama and creative writing divisions, performing on-stage at the University of North Carolina at Chapel Hill's Memorial Hall. The participating Veterans are winners of year-long, national fine and performing arts competitions in which thousands of Veterans who are undergoing treatment for disease, disability, or life crisis in VA medical facilities enter. The stories of progress and recovery that these Veterans share through their journey and in their art is compelling. The longest-serving Veteran participating in the Festival, George Farr, served in World War II; the youngest men and women come from today's recent Iraq and Afghanistan conflicts. This year, Air Force Veteran Jessica Herrera took first place in the special recognition category for her portrait, "Trading in My Heels for Combat Boots." The work speaks to her transition to the military, and now her life as a civilian. After years of struggling to understand a schizophrenia diagnosis that cut her military career short, Jessica found the art therapy program at the Albuquerque VA, and now works as an artist. More of these Veterans' stories are available through the NVCAF website. Many Veterans say that the arts saved their lives -- but in finding their creative voice, they are also enriching ours. 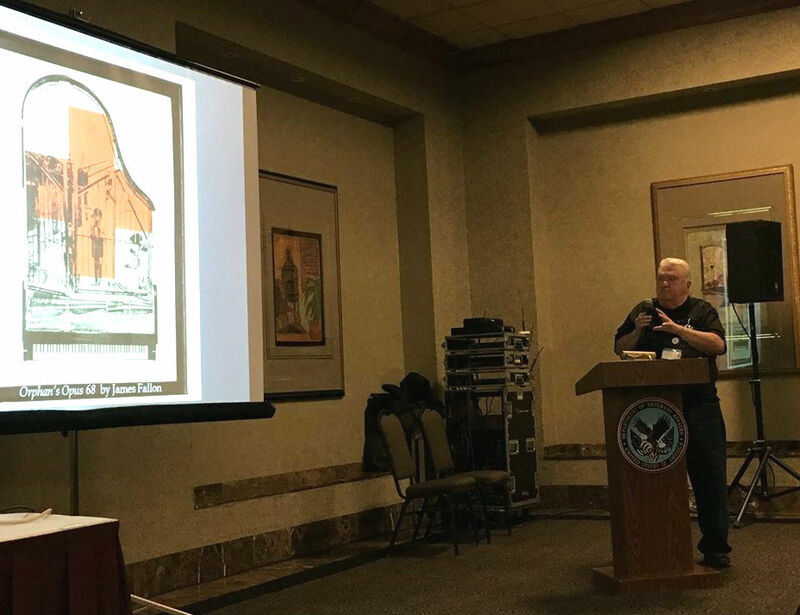 James Fallon, a medic during the Vietnam War, explains his artwork, Orphans Opus 68, and his inspiration to NVCAF visual artists. Photo by NVCAF, 2015. U.S. Army Veteran Eric Hoyer from the VA Health Care System in Minneapolis rehearses with dance partner Jessica Kerfeld for the NVCAF Final Performance. Photo by NVCAF, 2015. Americans for the Arts is pleased to be working with the U.S. Department of Veterans Affairs and the American Legion Auxiliary, along with many other national, state and local Veterans, arts, health and non-profits, as well as public agencies such as the National Endowment for the Arts, to create more opportunities and access to the arts -- for healing, for community, or just for pure joy. We are beginning to map the work taking place across the country through the National Initiative for Arts & Health in the Military National Directory. With a growing list of more than 100 programs and organizations in 37 states and the District of Columbia, we encourage everyone who has programs and services that are serving our military service members, Veterans and their families through the arts to submit your information. As we approach Veteran's Day, a time when our nation reflects on the contribution, sacrifice and legacy of our military service members and their families, let us not only recognize and honor the service our Veterans have already given to our country, but celebrate and thank them for their continued service through their commitment, their creativity and their ongoing contributions to us, and to our communities.